I am involved in an ambitious project called “Unlocking the Severn” that will see one of the UK’s rarest fish restored. It will take 5 years to complete, open up more than 250 kilometres of river and be one of the largest whole river restoration projects ever attempted. The benefits will not stop at this rare fish but will see all fish species increase and bring benefits to anglers, tourism and communities along the banks of the Severn all the way up to the Welsh border. The project will link the cultural, environmental and built heritage by telling a story of a fish that few people have even heard of but was once the most important fish on the river. So what is this fish? It is called a shad. Shad are an amazing fish and I will try and convince you why I feel that way. Shad are a herring, but not like the ones you see in the fishmongers. They do look very similar but this herring returns to fresh water each year to lay its eggs. The species used to be common around all the coasts of Europe but is now confined to just a handful of estuaries. Our only sustaining population is confined to the Bristol Channel of which the river Severn is the largest contributing river. Severn shad are well documented in records and books dating back to the 12th Century. A recorded history like this is very rare for a fish and this is why shad are so interesting. I have delved into these records in my spare time and it has told a fascinating story of this forgotten fish. I discovered that the first fisheries laws were to protect shad, introduced during the reign of Queen Elizabeth the first. Shad were routinely sent to the Royal households for eating and by the 19th Century they were held in much higher esteem than salmon, eaten locally and sent to Billingsgate fish market and even exported to Europe. What other fish can boast such a historical legacy? Despite all these records, what do we actually know about shad? It is easy to find out that there are two species. The extremely rare and larger allis shad and the more numerous and smaller twaite shad. But even this distinction was not recorded until the 18th Century. They are known as the “May” fish because this is when they return each year. They are also survivors, returning for up to six years from the sea to reproduce. If they are so amazing I hear you ask, why have I never heard of them? If you lived 200 years ago I would be amazed if you had not heard or even eaten one, but today they are confined to only a small part of their historical range and because they no longer swim past the towns and villages along the Severn their story and their place in history was almost lost. Their decline is easy to trace. The construction of weirs cut them off from their historical spawning areas. The weirs on the Severn were built in a five year period in the 1840s to improve the increasingly important navigation for iron and coal downstream and luxury goods, like wine, upstream. Within two years of completing these weirs shad had disappeared from the river above Worcester cutting them off from an incredible 85% of their reproductive area. For most fish species that would be the end, but shad clung on and still reproduce below Diglis Weir in Worcester and below Powick Weir on the river Teme. 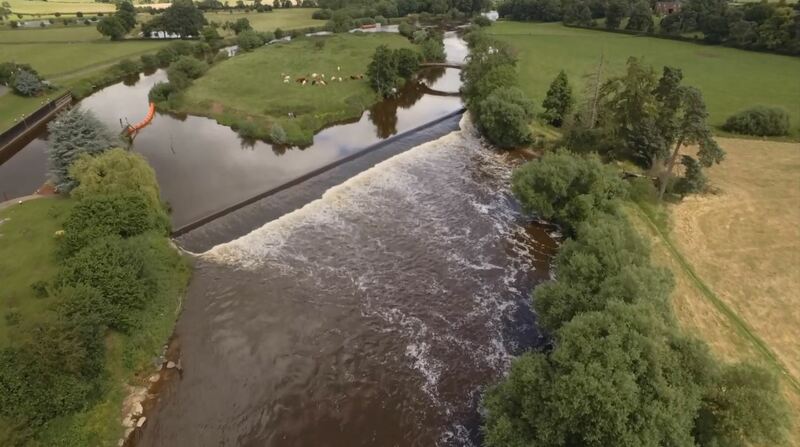 The numbers that remain are just a handful compared to hundreds of thousands before the weirs, but the good news is that the Unlocking the River Severn project is looking to change that. Shad are now protected by law and the Severn Estuary is designated for the species as a Special Area of Conservation. When I first started work on the river Severn in 1999 shad were just seen as a curiosity but gradually interest built. In 2012 when British Waterways changed into the Canal and River Trust the successful partnership that is behind this exciting project formed and there was real hope that restoration of shad could become a reality. The partnership of the Environment Agency, Severn Rivers Trust, Canal and River Trust and Natural England culminated in two successful funding bids. One for European Funds through the “Life” programme for the protection of shad and another to Heritage Lottery Fund to promote the heritage and cultural significance of shad. This funding will allow us to tell the shad’s fascinating story and in doing so reconnect shad to their lost historic range by the building of seven fish passage solutions. Before I retire I hope that I will not only see shad return through these fish passes (a viewing gallery is planned for Diglis Weir) but once again I will hear people talk about shad and the amazing story this freshwater herring played in the history of this great river. The artica Unlocking the Sevan for SHAD by Charles Crundwel 27october 2016. Fisheries and Biodiversity. Would this project be possible to be implemented to all other rivers in the U.K for the fraternity of Anglers and fishermen/woman on a voluntary basis. With the Severn as the guiding hub to the environment agency and fisheries and biodiversity to implement and cooperate in this project to bring SHAD back to the rivers . Of this most Historic fish. I have heard that the Mersey was an important shad fishery until the industrial revolution. I know there was a commercial smelt fishery, but nobody seems to know where to catch them now. Anybody know about either species, please.